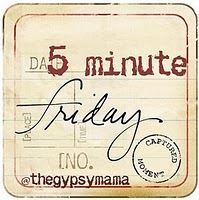 I'm participating in Five Minute Friday, a link-up writing prompt at Lisa-Jo Baker's blog. This week the prompt is "Again ..."
I think it was in the 2 o'clock hour this morning that I heard our 3-year-old boy peering over my husband's side of the bed. Yes, I could hear him peering. And then I heard him mumbling something about not being able to sleep. Once again, my husband was gracious even while his sleep was being interrupted. I'm not that gracious, usually even in normal waking hours. That was my one thought before I went back to sleep again. The first words out of my mouth: "You two need to go back to bed." They were scratchy, irritated words. There, again, my lack of grace. My 5-year-old girl starts in on the story of what's going on. "Ben came into my room." See, we just moved him to his "new" room upstairs. It used to be a guest room, but I thought he was ready. I think he likes being down the hall from his sister now. And while I appreciate him thinking she can help his sleeping woes, I really just wanted them sleeping. Again. Want to join us? Here are Lisa-Jo's rules: 1. Write for 5 minutes flat – no editing, no over thinking, no backtracking. 2. Link back here and invite others to join in. 3. Please visit the person who linked up before you and encourage them in their comments. That is like the one rule we all really care about. For reals. Three cheers for gracious husbands! I was up at 4:30 this morning too, with a whimpering sick baby... I tried to be gracious too but 4am comes so early! I hope your littlest one grows to love sleeping in his new room :) God bless and have a great Friday! Oh, I can so relate. :) I'm glad for you that they went back to sleep...those early mornings can make a day really challenging. Thanks for sharing today! Blessings to you...have a great weekend!